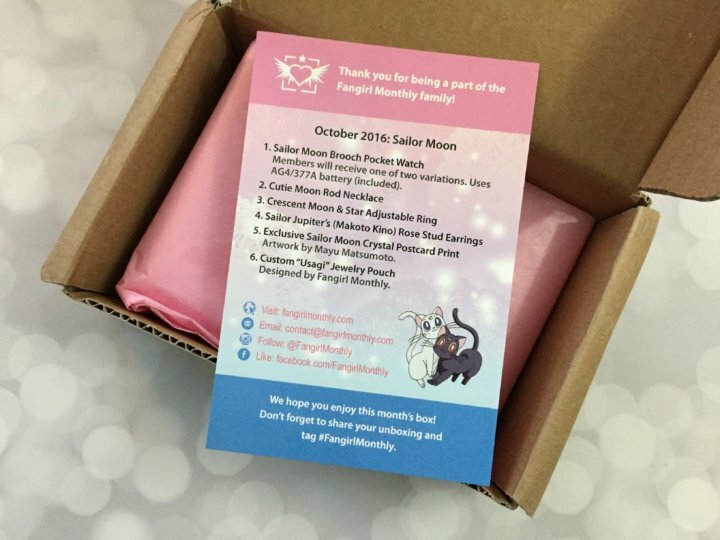 Fangirl Monthly is a new nerdy jewelry subscription box on the market, catering to the specific niche of anime and manga! I’ve been an otaku (geek) since I was about 7, and though my tastes have changed a lot since then, I still love anime and it’s what introduced me to the culture of Japan. 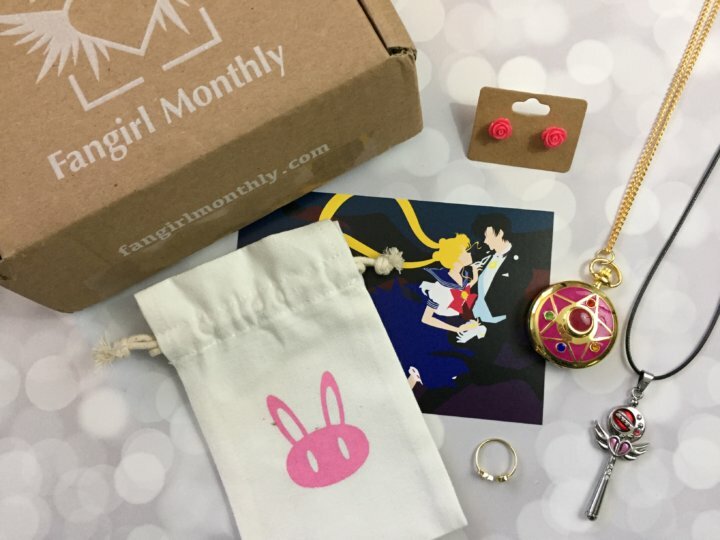 Fangirl Monthly sends a monthly box of curated jewelry and accessories around a specific anime series. Fandom boxes are difficult to subscribe to, because if you’re not familiar with the fandom it can be less exciting. A box like this is going to be the same sort of risk, but if you’re familiar with lots of series, you’ll probably really enjoy the month’s theme! Tsuki ni kawatte oshioki yo! In the name of the Moon, I’ll punish you! Fangirl Monthly’s inaugural box features an anime everyone has at least heard of, since it’s been around for over 25 years now! (Man, I feel old…) Originally appearing in the manga magazine Nakayoshi back in 1991, Bishoujo Senshi Sailor Moon is probably the flagship series to make its way from Japan to countries all over the world. Spanning 19 volumes of manga, two series of anime (20 years apart! ), more than a handful of movies, trading cards, video games, and even full stage musicals and a live action series, it’s no wonder that Fangirl Monthly decided to start off their new box focusing on a series so loved. Every month’s box will include a postcard print as well as a drawstring bag to keep your jewelry in, related to the month’s theme. Usagi Bag. Japanese lesson time! Sailor Moon’s real name is Tsukino Usagi. (In Japanese, surname precedes given name.) Tsuki = moon, Usagi = bunny/rabbit, and to simplify things, think of no to mean “of.” Aside from her very unique hairstyle, how did more people not figure out her secret identity?! The back of the print is indeed a postcard! 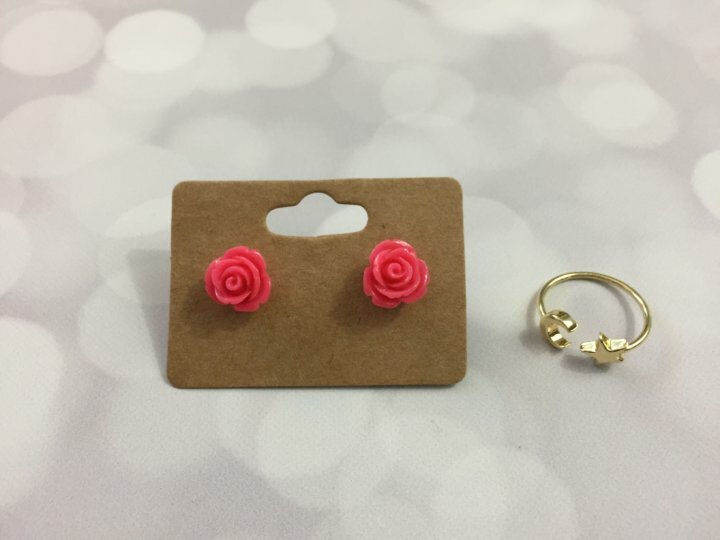 Rose Earrings. These earrings would be the perfect finishing touch on your Sailor Jupiter cosplay. I’m not sure who made these, so I can’t say for sure what the posts would be made of – if you have metal allergies or sensitive skin you’d need to be careful. 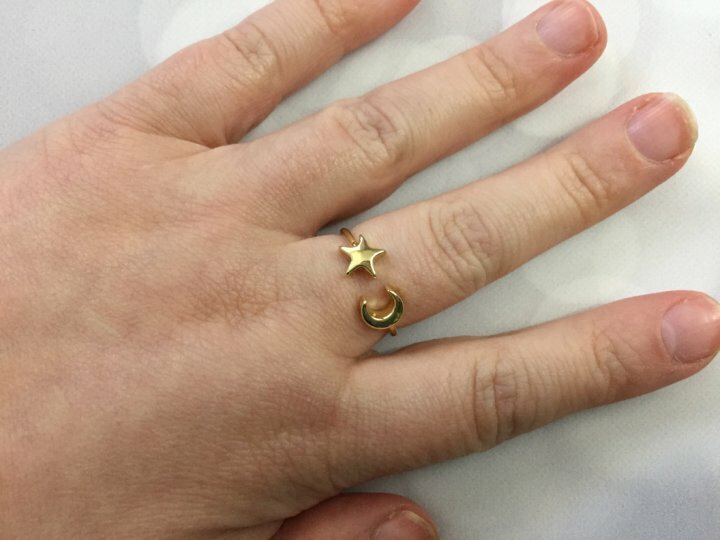 Moon and Star Ring. This ring fits me perfectly! It’s very apropos for the Sailor Moon theme, but it’s stylish enough you could wear it regardless. 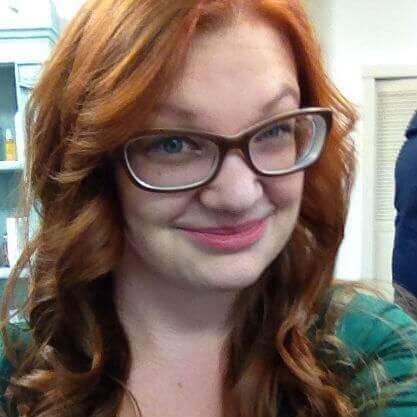 (Same with the earrings, honestly). It is adjustable. I’m somewhere between a 5 and a 5.5 (big knuckles!) but this fit my middle finger comfortable without adjusting due to the open side. Crystal Star Pocket Watch. 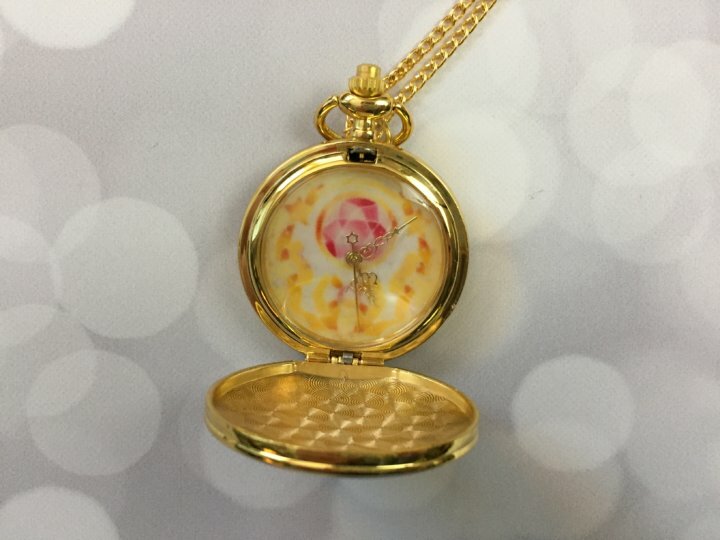 This locket is the second version of Usagi’s transformation locket. The chain on this is really, really long – when I tried to get a photo of it stretched out, the locket itself was tiny! 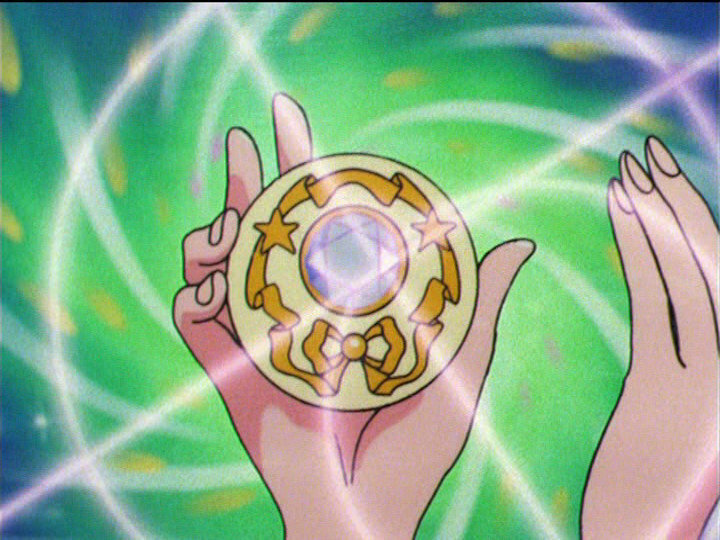 There are gemstones to represent the other four inner senshi, and it opens up into a pocket watch! Cutie Moon Rod. 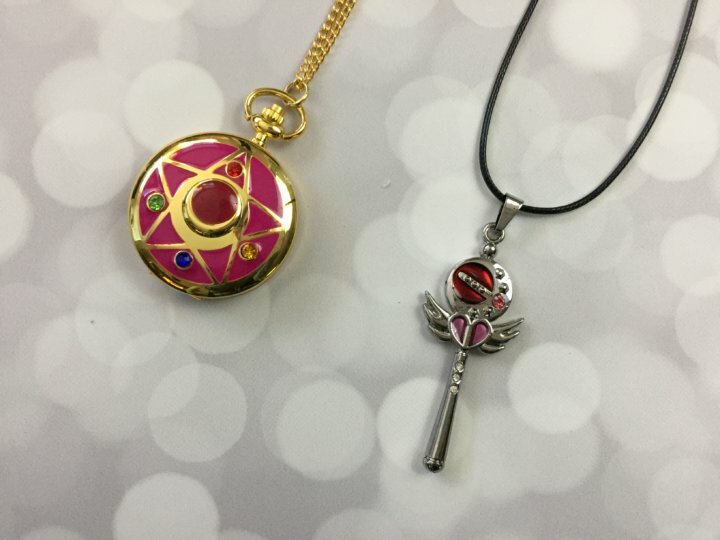 This Cutie Moon Rod pendant is actually a bit inaccurate – in the anime, the handle was pink and the wings and moon were gold. I like this toned down silver version with the enamel in the heart and orb. There are small rhinestones in the handle and on the moon as well. It’s very shiny. Here’s a photo of the inside of the pocket watch! The detail is incredible — the background is an overlay of the inside of the actual Crystal Star transformation locket. Moon Crystal Power, Make up! So here’s what I loved about this box – it was Sailor Moon (duh) everything was super cute and princess-like (kind of a requirement for a girls series theme! ), and everything was very wearable. Here’s the downside – everything is unlicensed and unofficial, and with the amount of bootleg Sailor Moon merchandise out there, it’s hard to know where the items came from, as well as the value. 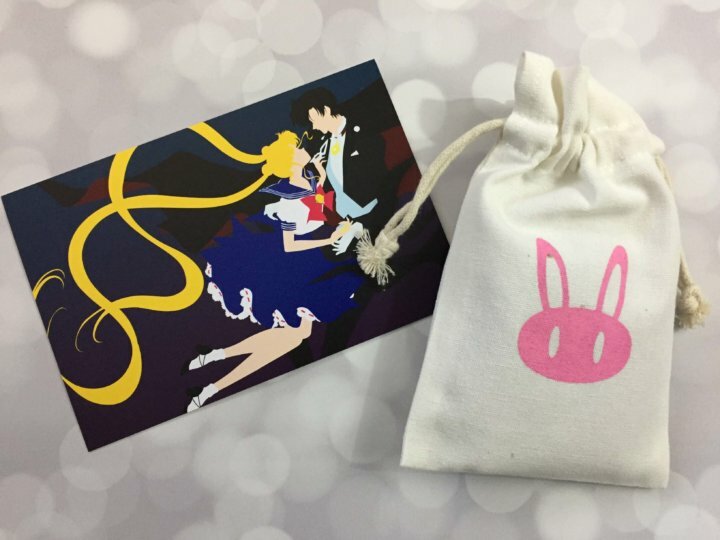 There are a lot of amazing creators on Etsy that make gorgeous jewelry and accessories for Sailor Moon and all other kinds of fandoms, and I would have liked to have seen one or two featured – it’s great to support small indie creators and businesses. I’m really happy to see a talented fan-artist like Mayu Matsumoto featured – and I want to see this continue, definitely! Overall, though, I’m pretty impressed with what they were able to achieve for their first box, and I’m excited to watch them grow and improve. 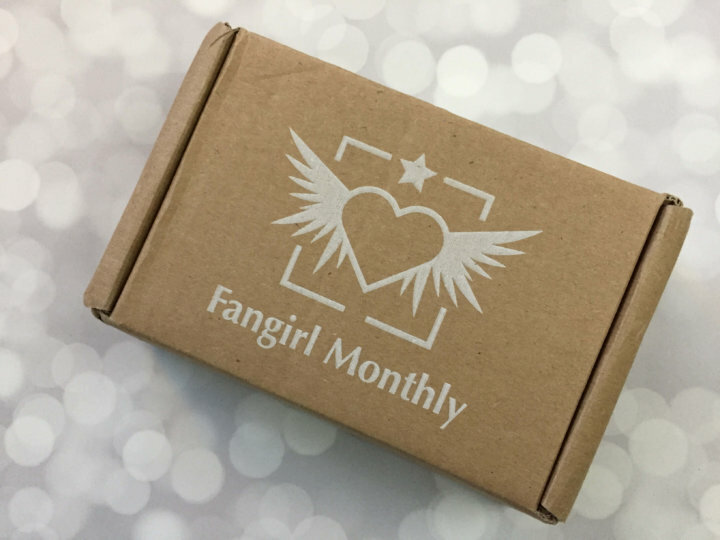 What did you think of the first Fangirl Monthly box? Get $3 off your first month of any subscription term with coupon code HELLO3. 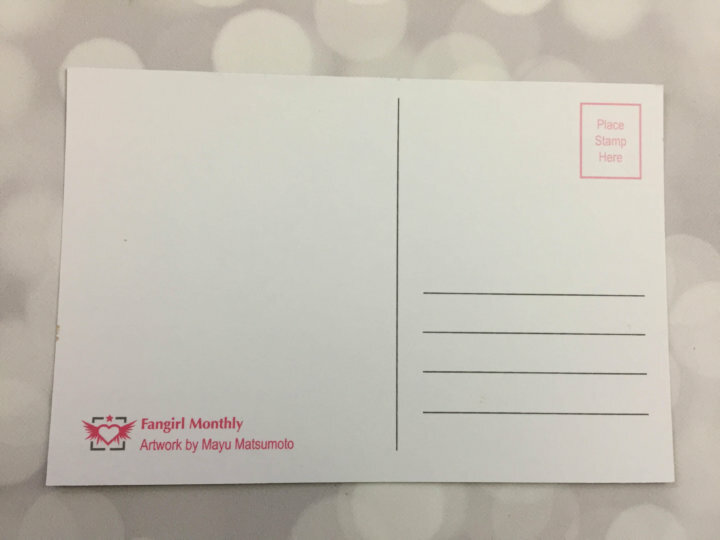 Visit Fangirl Monthly to subscribe or find out more! 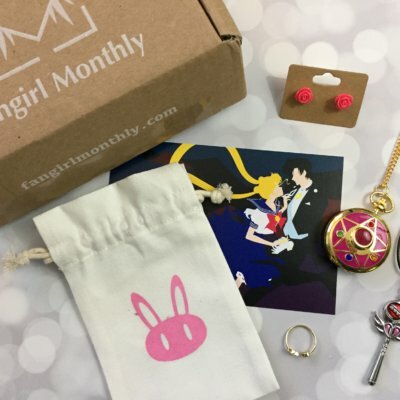 The Description: Fangirl Monthly is an anime/manga inspired jewelry and lifestyle subscription for the fangirl in all of us. Each month you will receive 3-5 hand selected pieces based on a specially chosen series or character. Items may include necklaces, bracelets, earrings, rings, and/or other lifestyle accessories. All monthly packages will also include a custom designed postcard and a custom pouch to store your jewelry. 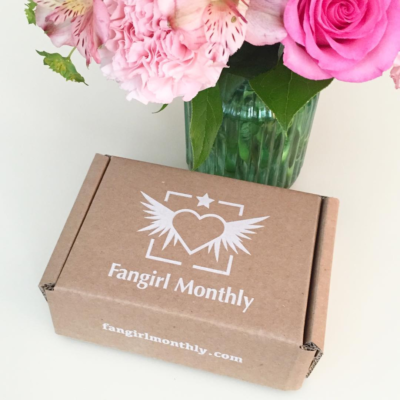 See Fangirl Monthly in the Hello Subscription Box Directory! The Categories: Jewelry & Accessories Subscription Boxes, Geek Gamer & Nerd Subscription Boxes. Geeky Fandom Jewelry Subscription Boxes, Geeky Subscription Boxes for Women, Fangirl Subscription Boxes.